Editor’s Note: This open letter from a group of UC San Diego faculty was originally published in The Triton, an independent, student-run website, on May 25. 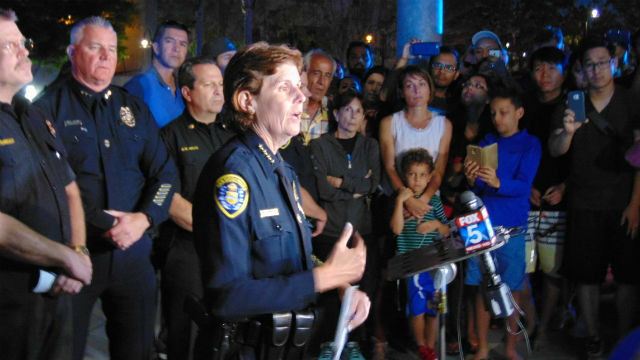 We reject San Diego Police Chief Shelley Zimmerman’s assertion that those targeted by Selis were victims of proximity rather than a racist hate crime. As many have pointed out, and despite the fact that University City was described in numerous news reports as a “diverse” neighborhood, it is majority white and has less than a 2 percent African American population and less than a 10 percent Hispanic population. The remarkably low percentage of African Americans is particularly noteworthy, given that five out of the seven individuals shot by Peter Selis were African American, one was Latino and one was White. Despite this fact, less than 24 hours after the attack, Chief Zimmerman held a press conference in which she foreclosed the possibility that this was a hate crime, choosing instead to humanize the killer by citing his financial and “romantic” difficulties. The police have continued to cover over race as a factor in this attack, despite eyewitness and survivor accounts revealing that the shooter intentionally spared a white woman who was trying to aid Monique Clark. Numerous reports published in the San Diego Union-Tribune have puzzled over what Selis’s motivations could possibly have been since he was not widely known to be affiliated with white supremacist organizations or ideologies; we also question the finality of the either/or logic with which a motive was definitively established. We know that students of color at UC San Diego face myriad forms of violence in their daily lives, ranging from classroom and workplace micro/aggressions, to hate speech and racist actions on the part of some student leaders and faculty, which has often gone unrecognized and thereby unaddressed by the university. We are therefore called upon to step up and commit to the struggle against racism, violence and oppression, in our many roles as faculty members — as teachers, advisors, researchers, community members and employees of the university.